Dear neighbors, what you see in the photo above are gluten-free yet pliable wraps. I am really, really happy with them. Some people would have labeled them « the best ever » in an attempt to attract more readers, but I won’t. Besides, claiming any recipe as « THE best » might discourage you from making your own variations, which would be very un-pedagogical, coming from a former teacher, one who also keeps tweaking things every now and then looking for the holy grail of gluten-free foods… Although in this particular case, and after making several batches, I can say that I have finally nailed it down in keeping with our personal taste. To make these wraps I completely ignored the bag of rice flour in my pantry. My husband and I are not too keen on rice flour ; the end products systematically taste dry not matter what. Luckily for me cassava flour is once again available locally and apples are in season. As in most gluten-free recipes, each ingredient is there for a purpose : for instance, here I prefer cassava flour to teff for its more neutral taste. For your information, I have tried this homegrown recipe with buckwheat flour also; the wraps actually tasted good (although not at all like wheat wraps) BUT did not fold without breaking – very disappointing. I will try to come up with a solution, unless one of my dear neighbors does it for me, as this is a more readily available and cheaper type of flour. Maybe some ground chia in the water will do the trick? The only issue with cassava that I am aware of is its high content in carbohydrates, not really one if you are physically active, right? As for the grated apple, it helps the dough stay pliable after cooking. During my very first experiment with this recipe, the wraps were a little too sweet, so I cut down the amount of apple. The final wraps still hint at some sweetness, but ever so slightly that it is not an issue, at least not for us, regardless of the filling. Besides, many store-bought wraps out there have added sugar among an interesting long list of ingredients, sulfites included! And if your favorite filling includes mayonnaise, I highly recommend making it yourself, using this recipe, introduced to me by Jack a while back. So easy to make, you just need an immersion blender, an egg, some sulfite-free mustard (made with distilled white vinegar), rice vinegar or fresh lemon juice, and the vegetable oil of your choice (I often use grapeseed oil). One final word : I have made sure that the quantities are easily divisible, so that you have the option of trying only one or two wraps before you decide for yourself if you will adopt (or adapt, ha-ha) this recipe. My daughter and I found this nifty “measure-n-pour” glass in a store. Very useful! * If possible, whatever your choice, use all natural nut butter, free of any added oil. 1. Mix nut butter with yogurt and add water. 2. Put all dry ingredients in your food processor. Add wet mix from step 1. 3. Grate apple and add to other ingredients in food processor. Blend until ball forms – between 20 and 30 seconds. If after that time the mixture doesn’t seem to be shaping correctly, add a little water. 4. Film and refrigerate for at least an hour. 5. Weigh and divide dough into equal amounts, roughly 75 g per wrap. 6. Shape each portion into a circle between oiled greaseproof paper and film, at first with your hand and then with a rolling pin. The wrap should be about 20cm / 8 inches in diameter. I use a small plate as a guide. Remove protecting film from top of uncooked dough. 7. Place the dough on a heated lightly oiled non-stick pan, GREASEPROOF PAPER STILL ATTACHED FACING YOU. Lower the heat and let the first side cook for about 3 minutes. As it does, it will dry and you will be able to peel off the paper without any trouble. Flip the wrap to cook the other side for another 3 minutes, while you prepare the next one on the same piece of greaseproof paper, not forgetting to brush it afresh with some olive oil. The dough cooking in the pan with the grease proof paper still attached. It is safe to start peeling off the paper starting with the right side, where darker spots are showing. 8. Place the cooked wrap on a covered plate until filling time in order to keep it moist. 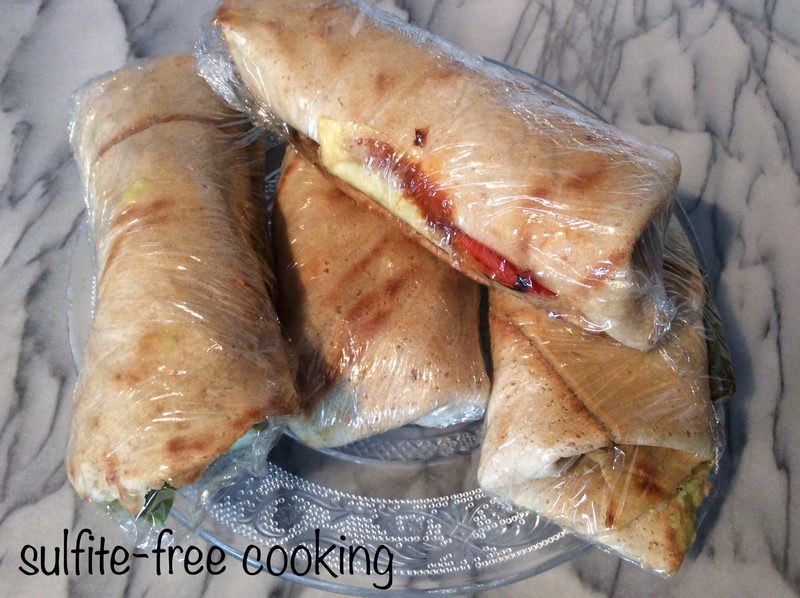 The wraps are best used immediately, but they can be stored in the fridge for a day (two maybe?) and “made fresh” again by microwaving them for 10 to 20 seconds – the time depends on your microwave. Next quinoa and vegetable medley curry with chicken or shrimp, and a nutty season for a nutty neighbor! These look really great. I found out the hard way I can’t tolerate cassava, but it seems to be a very versatile ingredient, I’ll look forward to seeing what else you’ll create with this flour. Thank you for linking to the mayonnaise, I couldn’t believe how fast it came together with so little effort. Sadly, not to sound like a broken record, lemons and most acids are out too. I’m currently playing with spices, hopefully I’ll have some success to share with you. Take care! Hello, dear neighbor, thank you for stopping by. I am not surprised that cassava doesn’t agree with you, since it is a tuberous root. Other people probably have the same problem, which is why I would like to have a buckwheat option. Of course you will be among the first to know if I do. I’m sure if anyone can crack it, or not rather, then you can. A wrap with buckwheat flour would be great. I’m currently still working my way through the squash scones and also making unsweetned waffles for a “fresh bread” substitute, but like you when using rice flour it does feel very dry. I’ve made rice flour and buckwheat pancakes that sometime really hit the right balance and other times just fall flat, the joys of free from baking, whereas with waffles they always end up on the drier side with both flours. Nothing a quick tahini sauce doesn’t fix. Nothing like a rice flour bread to bring one’s morale down, right? At least some of us take our gluten problem as a challenge, making us free from… supermarkets terrible GF options. Although I did find one pretty good loaf for toasting in the U.S. last spring. Forgot the brand name. Only two caveats: 1) too sweet for sandwiches and 2) extremely pricey. Of course. I would love a squash scone recipe, looking forward to it! You’re in luck. It’s this recipe: https://pepsfreefromkitchen.wordpress.com/2016/09/16/buckwheat-puree-scones/ but made with squash. Different fruits yield different textures so it’s an interesting recipe to play around with.